I don’t know anybody that relishes the idea of surgery, especially major surgery. But when it is a matter of life and death, most will submit to it willingly because it still beats dying. Well I want to talk about another operating room. In fact, I call it “The Parable of the Operating Room”. There was once a young man who, as far as he could tell, was leading a fairly normal and healthy life. Nothing seemed amiss, he wasn’t suffering from any maladies that he knew of, and he had every expectation for a long life. But at the insistence of a friend, he decided to have a physical examination anyway. If for no other reason than to be able to tell everyone around him that he was in perfect health. At the doctor’s office, many tests were run, and everything was checked to make sure nothing was overlooked. The young man was not nervous at all while waiting for the test results, because he felt fine. To his surprise, the doctor entered the room with a very concerned look on his face. He was looking over the test results and slowly shaking his head. Starting to panic, the young man what these symptoms could possibly be. As the doctor ran down the list, the young man could only agree and wonder why he had never thought of the symptoms as a warning. The doctor said that everyone with these symptoms thinks they are normal untitled hey see the way the test results should have come out. Then it becomes painfully obvious that the condition is lethal. Of course, now that the young man is aware of his true condition, he is more than willing to have the surgery. So the doctor has him admitted, has the young man wheeled into the operating room, and performs life saving surgery. All is well and the young man is eternally grateful for what the doctor has done. This is especially true since the doctor performed the surgery without charge. So what is the meaning of my little parable? Glad you asked! The young man is every one of us when we were without God. We were condemned by our sins, but had no idea that we were in any danger. All the while, we were in a spiritually terminal condition, doomed by the silent killer called sin. But at some point, often at the urging of a loved one, we are exposed to the Word of God. We looked into the Word and there, perhaps for the first time saw our true condition. When the Holy Spirit, through the Word, convicted us of our sinful condition before God, we responded by gladly asking God to do whatever was required to cure our condition. Please notice that the young man did not submit to this life altering surgery because the doctor had convinced him that, while he was okay, this procedure would make him even better and make his life easier. It was not until the young man was told of his true condition and its consequences that he gladly submitted the the master surgeon’s hands. Jesus Christ is the doctor, and the tools of His surgery are grace, faith, and His own blood. Baptism is, if you will, the operating room. Now operating rooms never operated on anyone. Surgeons do that. And surgeons don’t use an operating room as the cure for anything. The scalpel and other tools do that, in conjunction with a supply of blood. But the operating room is where the surgery is supposed to take place! No surgeon, if given the choice, wants to operate on the hospital lawn. 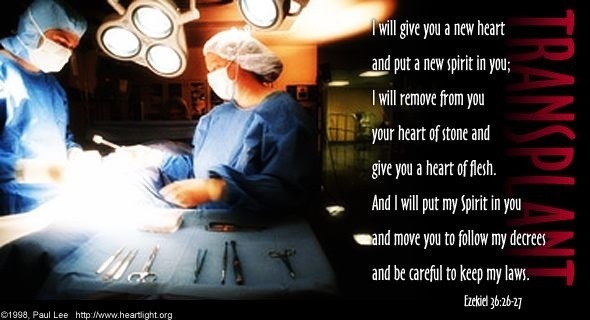 The proper place for surgery is in the operating room that was designed for that purpose. And when we try to omit the baptismal surgical suite, we are attempting an unnecessary shortcut that will endanger those we are trying to help. Thus endeth the parable; thus endeth the lesson.